I still can't believe how lucky we are with the weather this summer in London. The best summer I can remember since I came here (it is nearly eight years now!). I have got used to sunny days now and hope for some more before long, grey, English winter comes. On the days like this I don’t really feel like eating baked cakes. Ice cream or something fruity and refreshing is more appealing. When I found this recipe I knew straight away it would be yummy. 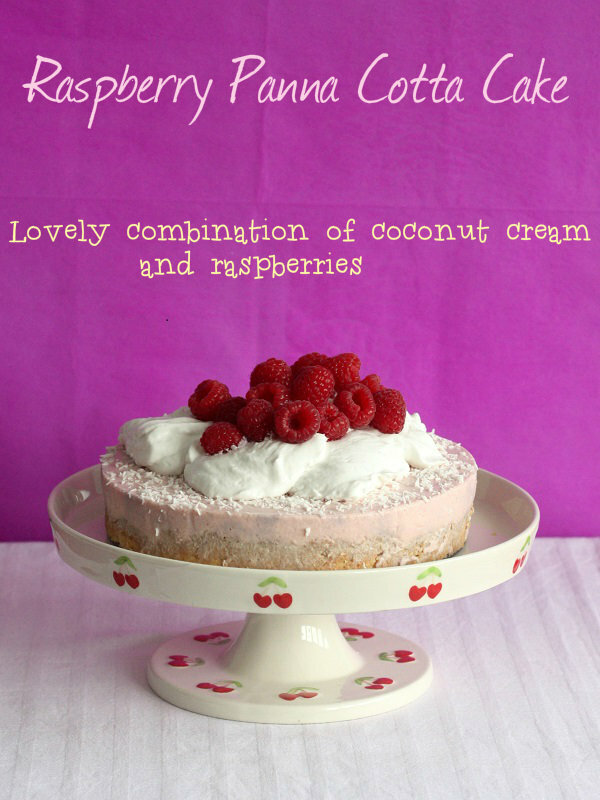 Raspberry panna cotta with a cloud of coconut cream on top looks beautiful and very elegant. It’s very easy to make though and tastes absolutely delicious. · Preheat oven to 180C. Place all the ingredients for the base in a large bowl and mix well together. Press evenly into 19cm deep cake tin with loose base (I bought mine in Morissons, here link to Sainsburys). Bake for about 10 minutes until golden brown and set aside to cool down. 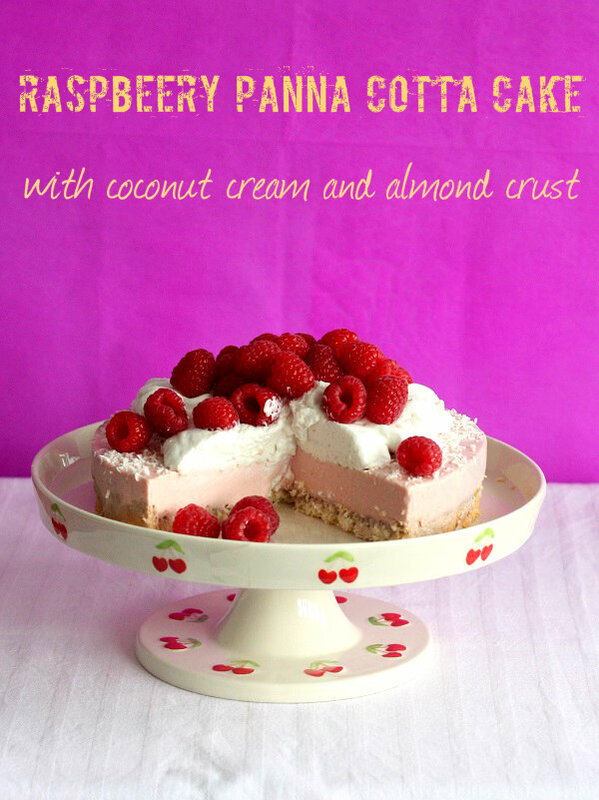 · In a medium saucepan place raspberries, sugar and lemon juice and bring to boil. Reduce the heat and simmer for about 10 minutes until raspberries realise the juice. Pour the raspberry juice and pulp into a sieve. Rub the juice and as much of the pulp through as you can, using the back of a wooden spoon. Set aside to cool down. · Dissolve gelatine in hot water and set aside to cool down. · In a large saucepan bring to boil cream and milk. Remove from heat and add cooked raspberries and dissolved gelatine. Mix well and let it cool down to room temperature. Place in the fridge and when it starts to thicken pour over the cake base. Refrigerate overnight. · In mixing bowl place the chilled coconut cream. Beat (using electric mixer) until stiff (note: whipped coconut cream is not as stiff as whipped heavy cream). At the end add Splenda (about 2 tbsp. or more if you wish). · Sprinkle the cake with desiccated coconut and spoon the cream over the cake. Decorate with fresh raspberries. Store in the refrigerator.